When I wanted to pre-order Diablo 3: Collector’s Edition, GameStop always responded that they weren’t taking pre-orders yet. The day it was dated I tried to pre-order it, and they said it was sold out. (I ended up buying it at Fry’s.) For Mists of Pandaria, I checked repeatedly. The day it was dated I called my GameStop and asked if they were accepting pre-orders. They were! I confirmed that I didn’t need to pick it up at midnight and that I had a few days to pick it up. They let me know that they actually hold collector’s editions of games for weeks. Fantastic! After work that day I went to the store, asked them all the same questions again, and put my money down. Later, I went back to that GameStop to pre-order a Wii U. While I was there, I checked on my pre-order to make sure everything was set with Mists of Pandaria. Everything was good. I asked all the same questions again and was reassured. I wasn’t going to go to the midnight launch because I prefer sleep. However, it didn’t matter much anyways because my friends Alex and Darnell were visiting the week of the release, and I was going to be with them Monday and Tuesday anyways. On Wednesday after work, I stopped by GameStop to pick up my copy of the game. I told the cashier I had pre-ordered Mists of Pandaria. He replied with, “did you want to pick it up?” Yes, yes I did. He grabbed the standard edition without even asking me for my name or phone number. I informed him that I had pre-ordered the collector’s edition. He went to the back to look, came back a few minutes later, said “sorry, just a sec” and went to the other door. A few minutes later he returned to tell me that they didn’t have any more copies. Now I might forget the exact details, but I remember that he didn’t seem to offer any other information. I pointed out that I had pre-ordered it, and he was quick to tell me that they were short one unit in their delivery and that it wasn’t their fault. I told him that the whole point of pre-ordering is that I’ll have it for sure, and I told him about how I asked over and over about picking up a couple days later. He repeatedly reminded me that it wasn’t the store’s fault. Who cares if it’s corporate or the store? Either way, that’s the fault of GameStop. The cashier, David, checked in the computer and told me that the Spectrum store (near my office and the location of the launch event) had extra copies. He called them, and his half of the conversation sure sounded like they weren’t sure if they could give me one. I heard him say something along the lines of “well can I give you my phone number and have you call me if things change?” He got off the phone and told me that he was pretty sure he’d get one from them. He said Blizzard was going to pick up the extra from them the next day but that he was pretty sure they could ship one copy. They might get it by the end of the week or the next week. Then he asked me how soon I needed it. I told him that my guild was probably hoping I had it by yesterday. His manager told me to give them my name and phone number and that she’d figure out a way to get me a copy. She then let me know that everything would be okay. Well, it already wasn’t okay. We went to In-N-Out, and on the way I called Fry’s Electronics. They had some and would hold one for me if I provided my name, address, phone number, e-mail address, and credit card information. I wasn’t okay with that and decided to just wait until after dinner and go to the store. Then GameStop called. The manager found a collector’s edition at another store and offered to pick it up in the morning on her way to work. Then I could pick it up later that day. I knew if I went to Fry’s, I wouldn’t have much time to play that night anyways because of the queue, so I agreed. On Thursday I called the store in the middle of the day to make sure that they had it. They did. After work, I swung by the store and picked it up. I wasn’t able to play it that night because I was busy, but at least I had it. The store was in Orange, California on Katella and Tustin. Mistakes happen, and I wasn’t happy with how they handled everything; However, I was happy that the manager went out of her way to get me this copy. 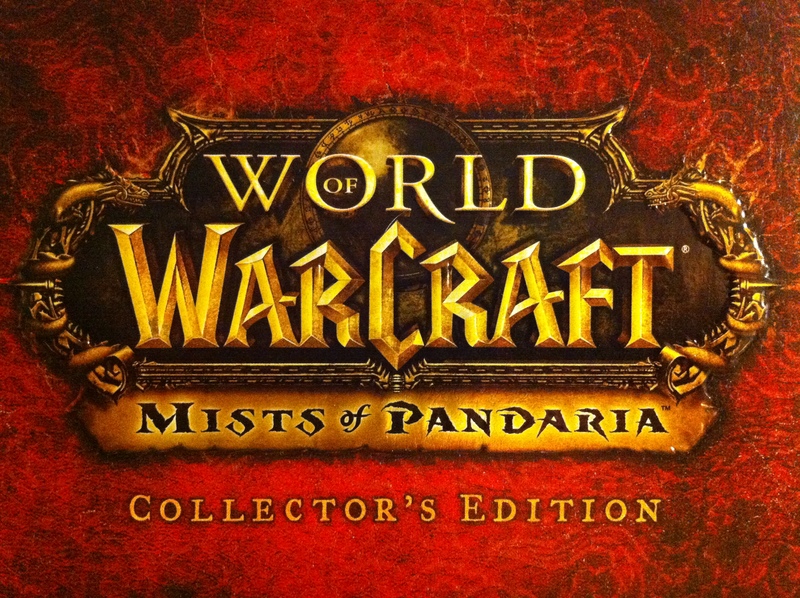 I’m still very nervous about my Wii U pre-order, but I have Mists of Pandaria: Collector’s Edition at least. Photo Op: I claim this city! 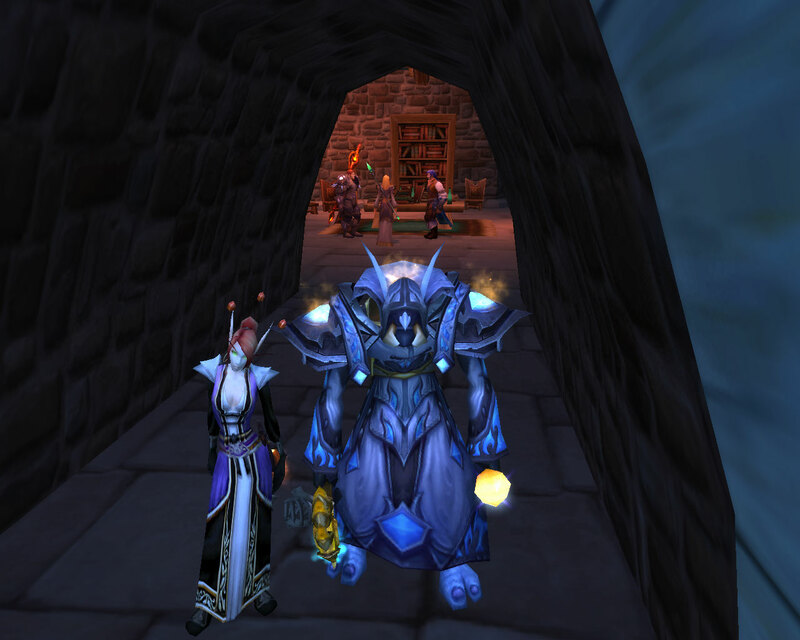 I haven’t had a chance to really play Mists of Pandaria yet, so here’s another photo op! After infiltrating Theramore, I claimed the city for myself! On my right is Mooglegem, and on my left is the warrior Vylane of Draka (from a random group). While running Theramore’s Fall a bunch, Mooglegem and I had to stop in Jaina’s tower for a photo. Behind us you can see Rhonin, Jaina, and Kalecgos. I wish they weren’t my enemies in this situation. Sorry you three! In other news, happy Mists of Pandaria! 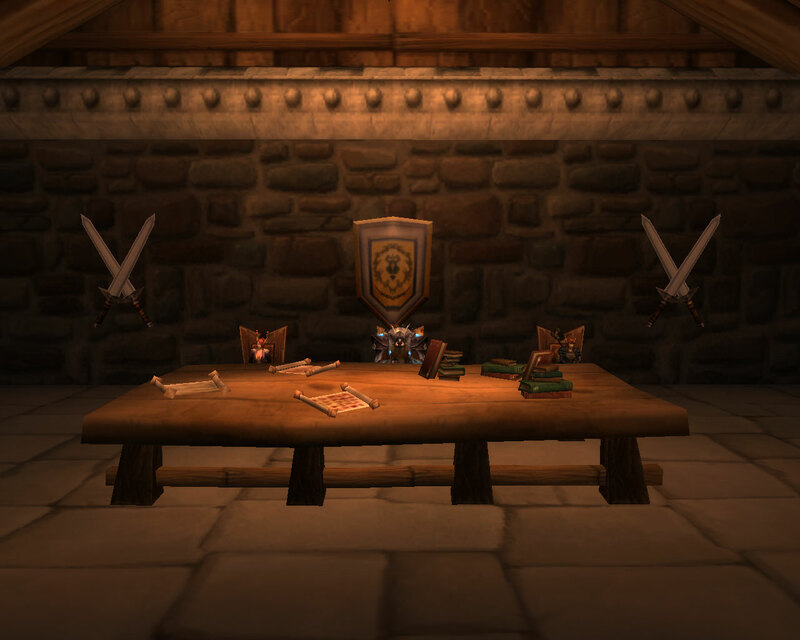 The attack on Theramore triggers the war that’s the start of Mists of Pandaria, so since I don’t actually have anything to say about Mists of Pandaria yet, this seemed like a good post for today. Today is the last day of Cataclysm. I thought it’d be a good time to look back over the expansion a bit. I hit my first level cap during Wrath of the Lich King, giving Dalaran and Northrend a sort of homie and familiar feel. Cataclysm was the first expansion to be released while I was actively part of the endgame, so it was a new experience for me. As Cataclysm was released, I left Carpe Flux Capacitor to make a guild with friends, Playground Brigade. It was fun to play with them, and I’ll happily remember working with my friend Elizabeth on the Conclave of Wind. And by working, I mean joking around in whispers when we screwed up. I really like that memory! We didn’t complete any of the three T12 raids, and the guild began to fall apart. I rejoined Carpe Flux Capacitor in, I think, 4.1. Unfortunately, my computer went down, and I didn’t get it back up until the end of 4.2. I managed to catch up on the troll heroics and jump into Firelands, killing Ragnaros before killing any other boss. I don’t regret my time with Playground Brigade, but I really regret leaving Carpe Flux Capacitor. That seems contradictory, but I still feel bad for leaving. I enjoyed the zones for the most part, and the linearity didn’t bother me. Of course, I don’t have alts either. Vashj’ir was really fun in my opinion. I loved the story and the feeling of loneliness in the zone. I wish the story had continued! Hyjal was pretty cool, but I know I forgot a lot of the plot points as they were happening. Deepholm was fun, but I wish Therazane the Stone Mother would have showed up against Deathwing. Uldum was interesting, but the cutscenes screwed up on my computer all the time and would just show me the ground. I might have liked it more if it worked! Twilight Highlands was fun, and I enjoyed it while I did it. Most of it wasn’t memorable, but I enjoyed surfing on the drakes, exploring, and noticing the fun names of areas and NPCs. The Zandalari patch was very fun. I’d like to see Blizzard use the option of a content patch without raids in the future. It’s not that I don’t enjoy raids, but Blizzard shouldn’t feel obligated. The raid finder sort of killed Carpe’s drive to raid, but I still think it’s a great tool. I’m thankful that in the future, I’ll always get to see all the content even if I can’t devote all the time. Cataclysm also brought about void storage, reforging, and transmogrification. I filled my void storage on the first night, and would love to see more. Reforging is actually a bit annoying to me. It just adds an extra puzzle that I don’t enjoy. (Well, I just use Ask Mr. Robot.) Transmogrification, on the other hand, is one of the best features Blizzard has added in a long time. I already collected cool gear that I could only wear in town. Now I can be seen in it! I love PVP, but I didn’t enjoy the two new Battlegrounds very much. Twin Peaks is just Warsong Gulch 2, and Warsong Gulch is much better. The Battle for Gilneas is decent, but I enjoy Arathi Basin a bit better. I’ll still play and enjoy Battle for Glineas as well, but I don’t know what it is about Twin Peaks that I dislike so much. It’s been too long since Tier 12 for me to do an analysis really without revisiting. I enjoyed them for the most part though. As a healer, Chimaeron was an interesting fight. Atramedes the blind dragon was also very cool, although his sonar pulse didn’t show up right on my screen! I’m not really qualified to talk about most of the Firelands bosses either since I came late. The zone design was great though, and the Molten Front ties were fantastic. I’d love to see more of that. Ragnaros felt pretty epic. Honestly, it felt more epic than the Madness of Deathwing! Dragon Soul was enjoyable but flawed. Morchok was a nice introduction to the raid. War’sahj the Unsleeping and Warlord Zon’ozz had interesting mechanics, but I feel like only one of them should have been in the raid. Hagara seemed a little odd, but it really did fit with the story, and I like visiting old locations (and using old artifacts). Ultraxion was cool and fit well, and Deathwing running for it after he saw us defeat his creation was great. Warmaster Blackhorn felt like a step backwards. The fight was odd and anti-climatic, and it seemed to go against the rising tension. Fought a bunch of minions, fought a powerful dragon, went after Deathwing, fought a tauren, and then jumped on Deathwing himself! Which one of those seems out of place? The Spine of Deathwing was very cool. It was so different than other fights, and we’ve never fought a boss while standing on him previously! 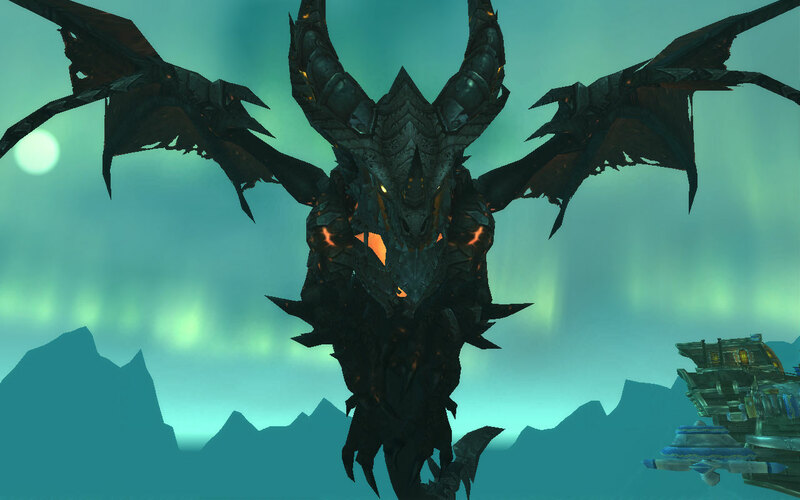 The Madness of Deathwing sounded good in theory, but it was flawed as well. First, it didn’t look like we were fighting Deathwing. The camera doesn’t go back far enough (without some tinkering) to get a good look. It was also, as far as I know, never really explained why he was full of tentacles. And then there are the Aspects. They’re mortal now? What powers did they lose? Ah, whatever. Soon it will be time for Mists of Pandaria. I’m already loving account-wide achievements, pets, and mounts. The new continent looks fun, pandaren seem interesting, and monks look pretty cool. I’m actually very excited about pet battles and farming! The character development should be excellent as well. It looks like Blizzard is developing Varian to be more heroic. This is very cool even as a Horde player. This will be a nice juxtaposition to Garrosh’s corruption. I’m looking forward to taking him down at the end of Mists of Pandaria!